How many times do you block advertising in an app or online? Yet, many companies persist in this marketing technique. In a new book, Wharton marketing professor Yoram (Jerry) Wind and The Wharton Future of Advertising Program executive director Catharine Findiesen Hays argue that the consumer is in control, and they want to interact with companies in new ways. 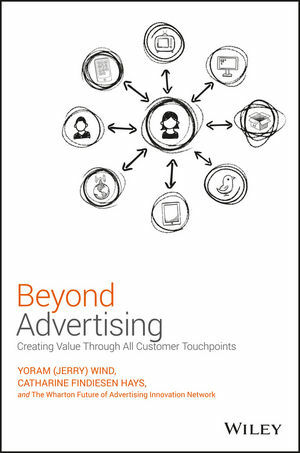 Their book, Beyond Advertising: Creating Value Through All Customer Touchpoints, addresses ways companies can develop a more integrated relationship with those they serve. Wind and Hays discussed their book on the Knowledge@Wharton show on the Knowledge@Wharton show on Wharton Business Radio on SiriusXM channel 111. (Listen to the podcast at the top of this page.) An edited transcript of the conversation follows. Knowledge@Wharton: How significantly has technology changed the playing field for companies, in terms of marketing, advertising and consumers? Jerry Wind: The major change is what it has done to consumers because it empowers the consumers. Consumers now can get information on any brand they want to buy — the features, recommendations, pricing — in a moment if they have interest. They can be in a store looking at some product, and they can get on Amazon and try to find out better prices. One of the major impacts of the technology has been the availability of technology, especially mobile, every minute of a person’s life. You can hardly separate now the person from his mobile phone, which changes dramatically the whole field of marketing. In a sense, the consumer now has access to all the information. There’s no longer this information asymmetry, where the manufacturer, the marketer, had information, and the consumer was at their mercy, not knowing what’s there. The consumer now has more information than the marketer. The consumer is in control. The consumer is skeptical. Consumers don’t trust advertising. They are the reason we have technology leading to the possibility of ad blockers. Consumers are sending a very clear message to advertisers: “We hate your advertising. We want to block it.” The advertisers, unfortunately, instead of listening to this and saying, “Okay, let’s change and follow some of the guidelines that are in the book,” they say, “Okay, let’s block the ad blocker,” which is the dumbest thing they can do. From the consumer point of view, the technology has changed everything. From the media’s point of view, look what’s happening in terms of digital advertising today. Digital advertising is really taking over to a large extent from the traditional one. But it’s one component. It has to be viewed as part of an integrated whole. So technology has been a major, major force of change, as an enabler for some of the changes we’ve been seeing. Knowledge@Wharton: As you just said, the consumers have more information than the marketers themselves. A lot of consumers realize the increased power that they have in this process now, more than ever before. That’s a big shift. Catharine Hays: It has really changed the nature of the relationship, from one where you had no choice but to watch a certain number of channels and see a certain number of ads — that’s what it was. The power was truly in the hands of the marketer. But now, that’s shifted. The marketers who are really forward-thinking are actually excited about it. It’s a shift from feeling like they’re totally in control of what the conversation is around their brand to actually being part of a conversation — bringing consumers in, bringing people in — so that they are part of a cultural zeitgeist, in fact, and part of people’s lives. Knowledge@Wharton: Who are you trying to reach with the book? And what’s the main theme that you want to communicate? Wind: I gave a presentation on our book to a group of 25 CMOs in the last Association of National Advertising meeting. Remember, the book is Beyond Advertising. “Beyond advertising” means primarily that you want to reach consumers not only through the traditional media but through all touchpoints. That’s really the key change. After the presentation, one of the CMOs in the room said, “We’re the wrong audience for you.” I said, “How come? You’re the marketing heads.” He said, “No, this is really a call for CEOs.” Fundamentally, no CMO, or no one in the organization other than the head of a business unit or the CEO, has control over all touchpoints. In our view, one of the key messages of the book is that to try to reach consumers effectively, you have to reach them not only through the traditional advertising media, but also through the package design, product design, store design and call center interactions — any point of interaction a consumer has with the brand. Unfortunately, corporations are organized by silos. So the marketing person has no control over the product, or even over the price, or even over the distribution…. The idea here is that’s part of the problem. That’s where you need the ability to reach all of them and bridge the silos. Back to your original question, our audience is really ideally CEOs, COOs, heads of business units. But it’s a must to marketing, must to advertising, must for some of the other units that basically have to interact, like the CTO, human resources, and others. Knowledge@Wharton: It also, in some respects, sounds like it just reinforces another theme: The fact that the role of the CEO has changed in the last decade. The CEO can no longer sit in the ivory tower and oversee everything. The CEO has to make visits to the mailroom and go down to marketing. That person, whoever he or she is, has to be multifaceted more so than ever before. Hays: In fact, one of the chief marketing officers that we had on our Sirius “Marketing Matters” radio show recently was talking about exactly that phenomenon. She was brought in to do a rebranding exercise. It was in the financial services arena. Things have been changing so much that they realized how they communicated about their products and services to their customers had to really change dramatically. But this was clearly not just an exercise for the marketing department. It literally was a reenergizing, a reexamination of the entire corporation. To your point, the CEO was on board from the very beginning, so that the whole corporation was going through this…. Knowledge@Wharton: You note in the book is that not every company is ready to embrace everything that they need to over the next 10 to 15 years to be successful. Wind: Absolutely. We suggest in the book what they should do about it and how they should transform themselves…. To be effective, what you have to do is align the objective of the brand, the consumers and society. Increasingly, the millennials are looking for companies that are doing [good]. They are trying to help solve society’s problems. The book, in a sense, is also for public policy decision-makers, in terms of how to deal with the issues related to advertising: deceptive advertising, ad blockers and others…. Hopefully the book will encourage people to avoid deceptive advertising and to provide a type of advertising we’re recommending, which is respectful and relevant for the consumers. Keep in mind, every one of us is a consumer. In the book, we rarely use the term “consumer.” We talk about people. We don’t want to focus only on the role of consumption that a consumer has, but rather, on people in general. Knowledge@Wharton: We’re at a point now where not only do the consumers have as much information or more than the people who are doing the marketing; in many cases, the consumers understand it even better than the marketers, as well. Hays: They also have higher expectations. The new model that we’re putting forward was really intended to look ahead on the horizon, see what these forces of change are, and put together this design for what advertising and marketing could and should be for the future, such that people don’t think about it as deceptive…. But instead, that it’s something that is actually welcomed. It’s seen as a gift and something that is actually creating value in their lives. That’s why the subtitle of the book is “Creating Value Through All Touchpoints.” At the intersection of the brand and people, good things are happening. That’s seen as a positive, which isn’t the way that it is now. But there are a lot of brands that are definitely paving the way and thinking about it. Knowledge@Wharton: In the book, you set down the changes that we’re seeing in terms of the vocabulary that is being used — and needs to be used. Hays: In fact, that was one of the key things that we found coming out of it. Jerry has done a tremendous amount of work in the area of mental models, or mindsets. There are a lot of negative ways that people think about advertising, and for good reason. One of the terms is “target” to talk about the consumer, which sees a person only through one lens. How much of my product does somebody consume? But that totally ignores the rest of them, in terms of their lives, their communities, their aspirations, where they’re going. The other term that we really love is this notion of “target marketing.” As you can imagine, we think about this individual with a bullseye on their forehead…. Words matter. Using different vocabulary can change behaviors. Knowledge@Wharton: For some companies that have had success for a long period of time, the old phrase, “if it ain’t broke, don’t fix it,” still plays a role in this. Wind: Unfortunately. But keep in mind interesting statistics. Of the 500 companies who were in the Fortune 500 in 1955, only 12% are still in the Fortune 500 today. That suggests that all these legacy companies who felt very comfortable with what they were doing are doomed, unless they are going to start experimenting seriously with a new way of doing things. The environment has changed so dramatically. The businesses models have been changing. So no one can just continue doing what they’re doing. They continuously have to start experimenting with new approaches and take advantage of some of the changes that are happening out there, like the development in artificial intelligence or cognitive computing. The development in virtual reality and augmented reality. The changes in the empowered, the skeptical consumers. You have to adjust to the times…. The whole book is really based on insights from over 200 thought leaders in the advertising and marketing area, answering two questions: “What could or should advertising be by 2020?” and “What should we do today to try to get there?” The book is really primarily based on this and other research that we’ve done, providing very explicit guidelines for the small business leaders and to others, in terms of, how to create effective advertising. Knowledge@Wharton: We could see a shift in who’s included in the Fortune 500 group in the next few years? Wind: Right. The encouraging note is that some of the more advanced companies, which are the newer companies – the Google, Facebook, Amazon, Apple – are continuously experimenting with new things. They are continuously also buying new companies in new areas. So, they buy capabilities in the area of analytics, in the area of artificial intelligence, and others. They realize that the world is changing so fast that either they can develop the capabilities internally, or they have to acquire them. They can go into open innovation and try to get some of this competence from the outside. But they cannot just continue what they’re doing. If the stars today, the AGFA four — the Apple, Google, Facebook, and Amazon — and companies such as IBM, which is also reinventing itself continuously, are continuously experimenting with new things, then definitely the old legacy companies out there cannot just continue doing what they are doing…. Knowledge@Wharton: One company that has obviously been a big story lately is Yahoo. Yahoo, if you go back 15, 20 years ago, was one of the premiere companies in terms of internet search, and now they don’t know where the path is to really reach the customer at all of those touchpoints that you talk about. Wind: Right. Part of the beauty of the book and the findings from our research is that we do provide very explicit direction on what to do, a real roadmap, [which is summarized in the] acronym of RAVES. It’s not only that we expect the consumer raves for what we’re doing, but it’s that any advertising, or any message or any offering, should be respectful of the individual that it’s aimed at and relevant. It should be actionable. It should be valuable — and valuable not only cognitively, but also emotionally. It should be experiential, and it should have a shareable story. People have been talking for years about advertising, and what is the story? But it’s not enough to have a story. You want to have a story that will motivate the consumer to share it with others. If you follow the RAVES model as a simple guideline for your advertising, you can improve enormously what you are doing. It’s not theoretical. It’s very practical. There is a lot of theory behind it that suggests why it is the right thing to do…. The advertising of tomorrow must be relevant and respectful, actionable, valuable and value-generating, with an exceptional experience and a share-worthy story, say the authors of this opinion piece.